Preheat oven to 400°F. 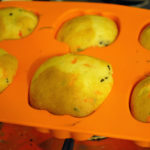 Grease or line a muffin pan with paper baking cups. Pour contents of jar into large bowl, add all ingredients, & blend. Bake 15-17 minutes, or until toothpick comes out clean. Cool in pans 10 minutes, then remove onto wire rack to cool completely.